Update: See the completed piece and read more about it here. More and more birds are emerging in Birds of Beebe Woods, including this 6″ long cedar waxwing. 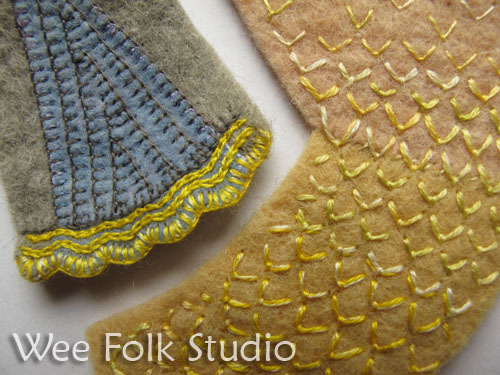 Here are the felt parts before they were all embroidered and attached. 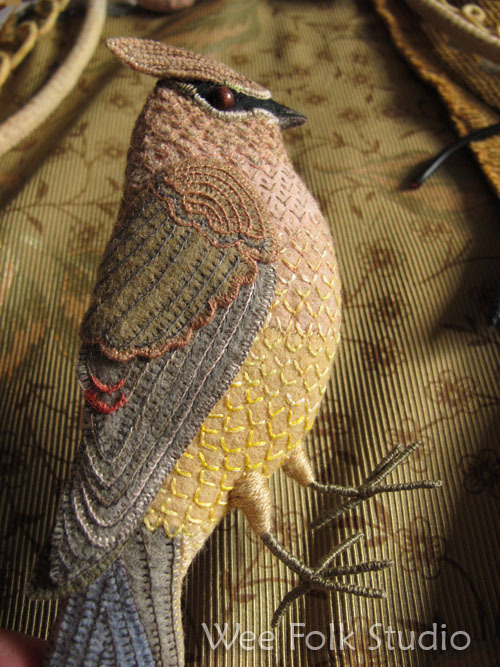 I like stitching the feather patterns and textures. 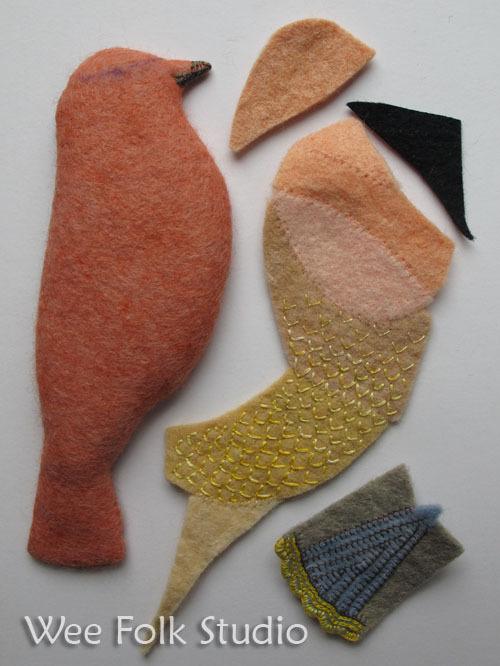 The September deadline for the Intimate Woods exhibit at Highfield Hall is approaching, so my goal is to make 3 small birds this week and more after that, if I have time. Then I have to attach everything to a stretched background, which usually takes longer than I think. Update: Posters and cards of Birds of Beebe Woods are available in my Etsy Shop. 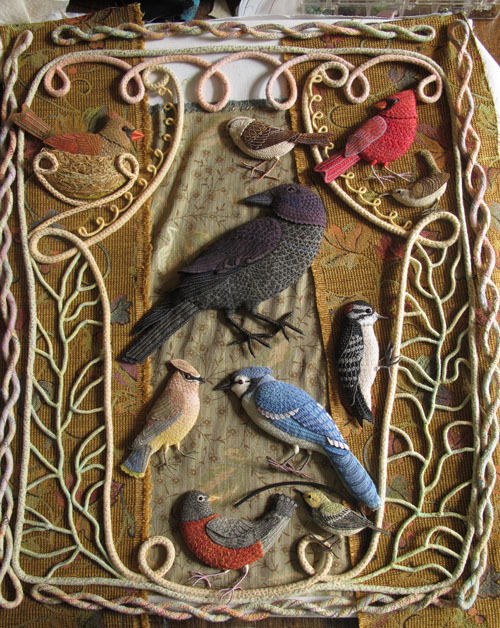 This entry was posted in Animals, Birds of Beebe Woods, Embroidery, Felt, Nature, Sculpture by Salley Mavor. Bookmark the permalink. I love the cedar waxwing. Well, I love all of the birds actually. Thank you for posting pictures of the process. So interesting and inspiring! LOVE this one too! This finished piece will be truly amazing. I sure hope to get to Highfield Hall to see it in person. Thank you for your step by step sharing, but seeing it come ALIVE will really be a treat. It looks like the birds will fly right off the table! I’m a HUGE fan of your work. Everything you make is beautiful, but these birds are WONDERFUL!!!! Especially like your cedar waxwing. What a beautiful piece of work! The finished product will do you proud!!! Your work leaves me speechless! it is just gorgeous, thank you for sharing the process, I so look forward to your posts and re-visit them often. Oh my I am going to try and see this one up close and personal! How elegant Mr. waxwing looks. Beautiful! I so admire your artwork! Incredible cedar waxwing! But then they’re all rather spectacular. You seem to effortlessly capture the spirits of the birds. Well done! unable to work on a project because of other things going on. I am absolutely swooning. This is amazing! Simply WOW Salley! I am always amazed at how” GOD Like” humans can be to take an object that is flat and lifeless and give it a three dimensional form that brings it to life. Whether it is clay that becomes a bowl, a clump of gold into a piece of jewelery, stands of grass into a basket or yards of fabric into a gown fit for a queen.. I am always amazed and humbled. Salley, your Cedar Waxwing is simply stunning! So very lifelike, and around our garden they are simply marvelous strawberry thieves. These birds are so charming we ignore the lost berries. Thank you so much for sharing your artistic treasures with all of us admirers. I am in awe of the birds emerging so gracefully on your beautiful piece. Can’t wait to see the finished work. No words I have for your fabulous work…..
Hi Sally, Thank you for sharing your work. It is both amazingly talented and inspiring. This is just beautiful! The Bluejay is my favorite! Oh my word, if I was there I would be tempted to kidnap that bluejay! 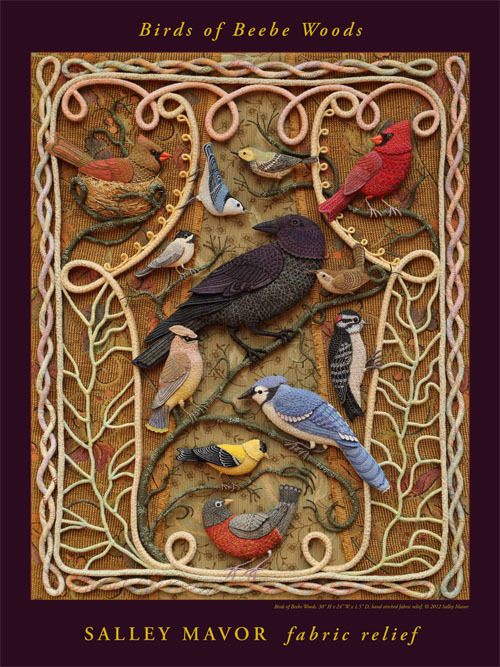 This piece is amazingly beautiful – a bird lover’s dream! You must have the world’s most nimble fingers – I can’t imagine doing all the stitchwork on this and all your other pieces. Such beautiful birds. Your work is so amazing! This is inspiring, Salley and I can’t wait to see it in person soon! Oh, I love this! What a wonderful piece of art. Wow, the birds are stunning. I love all of your work, but the birds are just amazing and so true to nature. Thank you for sharing how you make your stuff. It all looks very therapeutic to make; especially for group projects. i almost cannot belive someone actually made these birds one at a time. i know women had time and patience during medieval and perhaps the vistorian era, but in the 21st. century? you are an incredible woman. i am in awe! Your work is so inspiring , and so beautiful . Amazing work! I am so inspired…just exquisite. Brava! !